Canadian Nuclear Laboratories (CNL) is licensed by the Canadian Nuclear Safety Commission (CNSC) to decommission the Whiteshell Laboratories site located in Pinawa, Manitoba. CNL implements a comprehensive environmental protection and monitoring program, which controls and monitors emissions of radioactive and hazardous substances from the site and assesses any impacts to the public and the environment. In the early 1960s, Atomic Energy of Canada Limited (AECL) established the site for nuclear research. A major focus of the program was the Whiteshell Reactor #1 (WR-1 Reactor), an organically cooled research reactor, which was shut down in 1985. In 1997, AECL discontinued the program, and decommissioning planning began. As part of its decommissioning process, CNL is proposing to decommission the WR-1 Reactor through an in situ (leaving in place) approach. Before the CNSC can make a licensing decision on this proposal, the CNSC must undertake, and is undertaking, an environmental assessment conducted under the Canadian Environmental Assessment Act, 2012 to determine if the proposed activities will cause significant adverse environmental effects. The Independent Environmental Monitoring Program (IEMP) results for 2017 indicate that the public and the environment in the vicinity of Whiteshell Laboratories site are protected and that there are no expected health impacts. 1 The < symbol indicates that a result is below the provided laboratory analytical detection limit. 3 For radiological parameters where no guidelines exist, CNSC screening levels (also known as reference levels) were established based on conservative assumptions using CSA Group Standard N288.1-14 and ICRP 119. The screening level for a particular radionuclide in a particular medium (e.g., water, air, food) represents the activity concentration that would result in a dose of 0.1 mSv/y (millisieverts/year), a dose at which no health impacts are expected. 4 Tritiated water (HTO) is a radioactive form of water where the usual hydrogen atoms in H2O are replaced with tritium. Elemental tritium (HT) refers to the radioactive form of hydrogen gas. Under the Nuclear Safety and Control Act (NSCA), licensees of nuclear facilities are required to implement an environmental monitoring program (EMP) to demonstrate that the public and the environment are protected from emissions related to the facilities' nuclear activities. The results of these monitoring programs are submitted to the CNSC to ensure compliance with applicable guidelines and limits, as set out in regulations that oversee Canada's nuclear industry. The CNSC has implemented its IEMP to verify that the public and the environment around licensed nuclear facilities are protected. It is separate from, but complementary to, the CNSC's ongoing compliance verification program. The IEMP involves taking samples from public areas around the facilities, and measuring and analyzing the amount of radioactiveand hazardous substances in those samples. CNSC staff collect the samples and send them to the CNSC's state-of-the-art laboratory for testing and analysis. 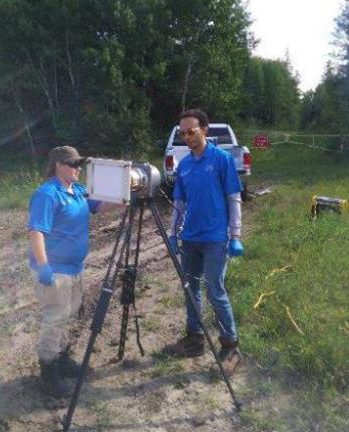 The area outside of the Whiteshell Laboratories site perimeter was sampled as part of the IEMP in 2017. CSNC staff collect air samples near the Whiteshell Laboratories site, 2017. The 2017 IEMP sampling plan for Whiteshell Laboratories focused on radioactive contaminants. A site-specific sampling plan was developed based on the CNL's approved environmental monitoring program and the CNSC's regulatory experience with the site. In 2017, CNSC staff collected air, soil, sediment, vegetation, food and water samples in publicly accessible areas outside the Whiteshell Laboratories site perimeter. CSNC staff also worked with the Sagkeeng First Nation to sample a Northern Pike from the Winnipeg River, caught downstream from the Whiteshell Laboratories site. CNSC staff will continue to work with Indigenous communities in future sampling campaigns to ensure meaningful results are obtained. The levels of radioactivity in all the samples were below available guidelines and CNSC screening levels. These screening levels are based on conservative assumptions about the exposure that would result in a dose of 0.1 mSv/year, which represents one tenth of the CNSC's public dose limit of 1 mSv/year. No health or environmental impacts are expected at these levels. The IEMP results confirm that the public and the environment in the vicinity of the Whiteshell Laboratories facility are protected and that there are no expected health impacts. These results are consistent with the results submitted by CNL, demonstrating that the licensee's environmental protection program protects the health and safety of people and the environment. To obtain the full technical IEMP report, contact us at cnsc.info.ccsn@canada.ca or call 613-995-5894 or 1-800-668-5284 (in Canada). Please provide the name of the facility and the report year.